The full moon of August will be with us tomorrow. 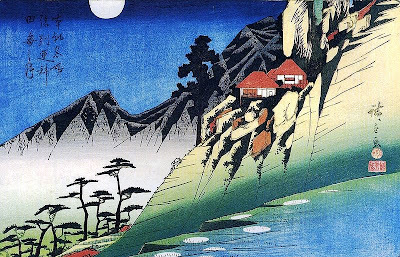 In one ceremony of ancient Japan this moon, seen reflected in water, symbolized more than anything else the mystery and transience of life. But to see the Moon at any time, and at any phase, can be an awe-inspiring experience. Whether you are in the comfortable north-western suburbs of London or camped out on an Antarctic ice-floe, the Moon presents the same inscrutable visage. It is a true wilderness, remote, aloof from our concerns, and, except for the assorted junk left behind by space programmes, as yet unbefouled. The familiar pattern on the Moon (representing a man’s face, a hare, a beetle, the Madonna and Child, or a dozen others, depending on your culture) is made up of the darkness of plains contrasted with the brightness of mountains. Seen with binoculars, the pattern disappears at once, and it is only then, with the Moon filling your field of view, that you get some idea of its majesty and size. For, although the Moon is held to be a mere satellite of the Earth, it is much bigger than the moons of Mars or Jupiter, being over 1/5th the weight of the planet Mercury. Indeed, according to one theory of the Moon’s origin, it was once a small planet, with an independent orbit. This theory suggests that, at some time at least four billion years ago, the Moon passed sufficiently close to the Earth to be “captured” by the Earth’s gravitational field. As the Moon passed there would have been huge tides, miles high, in the Earth’s oceans. The energy to produce these tides was thus transferred from the Moon to the Earth, slowing the Moon down and preventing it from getting away. There is a theoretical limit at which any satellite can remain intact, called the Roche limit, which, in the case of Earth, is about 3,700 miles from the planet surface. Once the Moon reached the Roche limit it began to break up, losing half its mass to the Earth, especially the heavier rocks containing iron. This material became the present continental land masses. The remnants, now just outside the Roche limit, gradually reformed into a sphere and began to retreat, towards the Moon’s present mean distance of almost 240,000 miles from the Earth. An older theory was that the Moon was originally torn from the substance of the Earth, leaving behind the scar which we now call the Pacific Ocean. Recent understanding of the way continents drift makes this idea seem less likely, as does the fact that rock samples brought back by the Apollo missions prove that the geology of the Moon is very different from that of the Earth. All the planets in our solar system, and their satellites, were formed by clouds of gas from the Sun, but not all were formed at the same time or from the same cloud. Another theory of the Moon’s origin is that the Moon has always been in the Earth’s orbit, but was formed from a different cloud. Of the three theories, the first is perhaps the most favoured today. Since we do not yet even know in detail how the Earth was made, it may be premature to expect firmer knowledge just yet. These are matters for the physicists and mathematicians to ponder. But it requires no special knowledge to look at the Moon, and if you have even an old pair of opera glasses you can follow in the tradition set by Galileo, who first turned a telescope on the Moon in 1610. Although he probably knew that no large expanses of water were to be found there, it was he who named the dark areas maria (seas) and the light ones terra (land). These terms have survived to the present day, inappropriate as they are. We now know that the Moon’s surface is almost unbelievably harsh. When Neil Armstrong took that “giant step for mankind” on 21 July 1969, he stepped into a desert of black, basaltic dust and rock, baked during full sunlight to the temperature of boiling water and frozen during the lunar night to the temperature of liquid air. On the Moon there are mountains higher than the Himalayas and craters up to 180 miles across and 2,600 feet deep. The atmosphere is extremely thin, for the Moon’s gravity is only 1/6th that of Earth. This means that there is almost nothing to protect the Moon from the impact of meteorites, the chunks of rock which, hurled out perhaps thousands of years before by some disintegrating star, travel on and on through empty space until they meet an obstruction. Most of those striking the Earth get burned up by friction with our thick atmosphere: not so on the Moon. The surface of the Moon is buried to a depth of several feet in meteorite debris. Its entire surface is pockmarked with craters, from the microscopic to the gigantic. When the impact is especially great, splashes of moondust are thrown in all directions. These bright splashes are called “rays”, and, until disturbed by further impacts, may clearly be seen from Earth. One of the most perfect craters, as yet virtually undamaged by subsequent impacts, is Tycho. This is in the southern hemisphere, at about the same latitude as New Zealand is on Earth. The 54-mile wide crater has a sharp central peak and walls which rise to 16,000 feet. The splashes radiating from Tycho have spread out across almost the entire visible face of the Moon, one ray even being seen to cross the Sea of Serenity in the northern hemisphere. The best views of the Moon are usually to be had at other phases, when the slanting sunlight makes the surface stand out in sharp relief, but full moon is the time to see the rays of Tycho. The full moon – and what better than the August one, traditionally the moon to be viewed – is also, perhaps, the most impressive and the most suitable way of reminding ourselves of the true value and scale of things.